PULLMAN – In the days leading up to Washington State’s last regular-season home game, coach Ernie Kent insisted that the so-called Senior Day is not about the players that leave a program but those who replace them. The guard is changed and the torch is passed, claimed Kent, by younger players assuming the leadership mantle and ensuring that the seniors win their last game in their own arena. 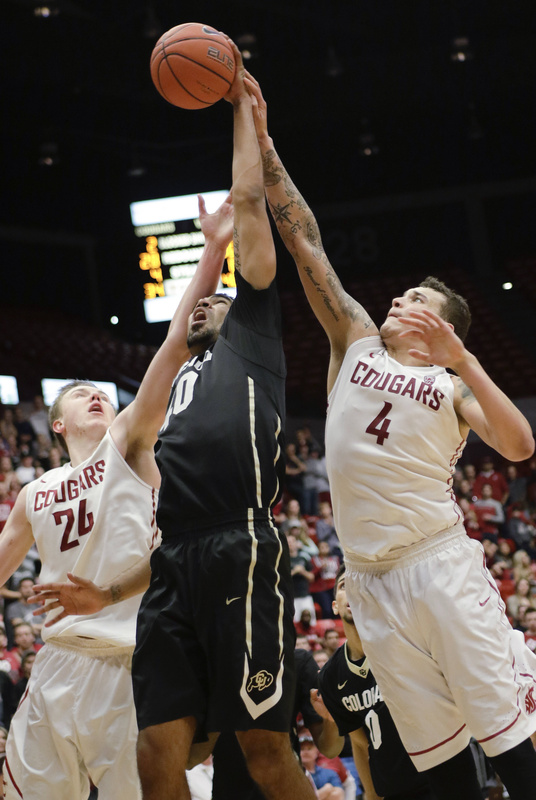 Sophomores Ike Iroegbu and Josh Hawkinson rose to their coach’s challenge and paced the Cougars for nearly 40 minutes of Saturday’s game against Colorado. But it was WSU’s seniors that stood tall in the final moments and carried the Cougars to a 96-91 overtime-victory in front of 3,434 fans. Iroegbu missed a game-tying layup with 11 seconds left in regulation and the Cougars trailing, 77-75. The Buffalos called timeout and inbounded the ball to Askia Booker – an 83 percent free-throw shooter. But Iroegbu and fellow sophomore Que Johnson grabbed the ball in Booker’s hands without fouling, forcing a tie-up with the possession arrow pointing toward WSU. The Cougars called timeout and Kent put the ball in senior DaVonte Lacy’s hands and called for a ball screen to either free him up for a shot or draw the defender and allow him to create a play with a pass. The screen never came so after a couple dribbles Lacy took a step back and fired off a shot that bounced off the rim and in, sending the game to overtime after Booker’s ensuing three-quarter court shot rimmed out. Another of WSU’s seniors, Dexter Kernich-Drew, hit a 3-pointer to start overtime and WSU’s third senior, center Jordan Railey, emphatically blocked a dunk attempt by CU’s Xavier Johnson. Lacy followed with a 3-pointer of his own and then missed a 3 on WSU’s next possession, but Railey was there for a tip-in. Every field goal WSU scored in overtime was scored by a senior and the trio of Kernich-Drew, Lacy and Railey finished with 17, 17 and 12 points, respectively. The underclassmen were particularly potent in the first half. Josh Hawkinson scored 18 of his team-high 21 points in the first half, thanks in large part to the nifty passing of Ike Iroegbu, who had 18 points himself and a career-high 11 assists. Iroegbu dribbled through CU’s defense with ease in the first half, drawing defenders and then dropping off pocket passes to Hawkinson for easy floaters and hook shots near the basket. CU, which beat WSU by 32 earlier this season, was led by forward Josh Scott’s 32 points and 12 rebounds, with Booker chipping in 26 points. With the win the Cougars finish No. 9 in the Pac-12, a two-spot improvement from last season and two spots higher than they were projected to finish in the preseason Pac-12 media poll.